Can anyone help me identify the makers marks on this imari bowl and saucer? I have an imari bowl and saucer which has been used to house a small plant pot for years. I thought it might be an idea to try to identify the marks on it but after hours of searching pages and pages of porcelain marks on line I have drawn a blank. I wonder if anyone can help me identify the makers marks on this imari bowl and saucer. Any and all help appreciated, thank you. Hi Richard, your imari bowl and saucer mark is attributable to items produced by the Dresden Porcelain Co. of Blythe Works, Longton. One of the Staffordshire Potteries. 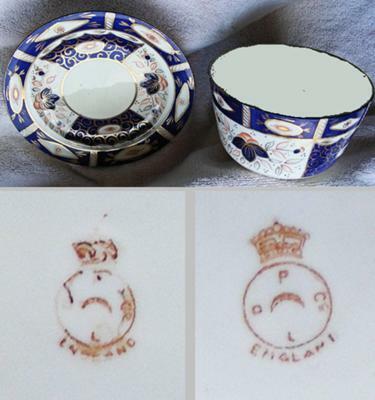 It was previously known as T Forrester & Son and afterwards as the Blyth Porcelain Co. Ltd. The makers mark dates your item to between 1896 and 1903.